All Happy Jack homes currently listed for sale in Happy Jack as of 04/23/2019 are shown below. You can change the search criteria at any time by pressing the 'Change Search' button below. If you have any questions or you would like more information about any Happy Jack homes for sale or other Happy Jack real estate, please contact us and one of our knowledgeable Happy Jack REALTORS® would be pleased to assist you. 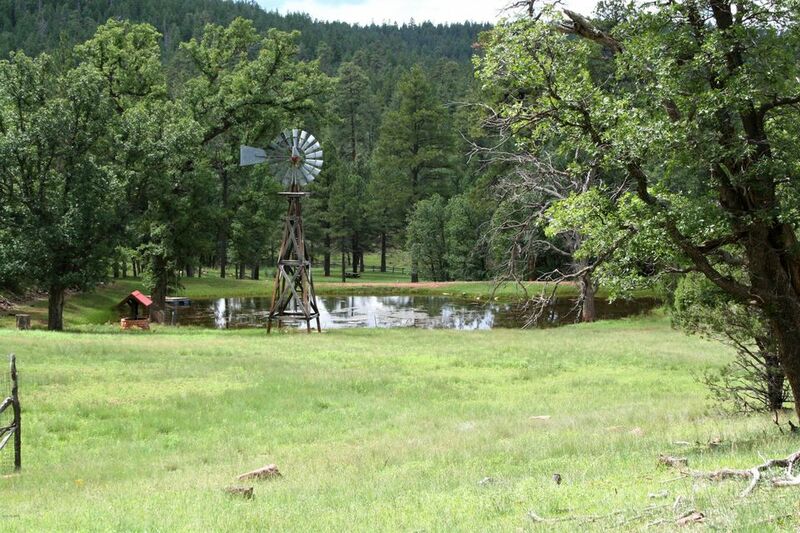 "Little Springs Ranch is a historic 59.3 acre original homestead situated amid lush stands of old growth Ponderosa Pine, Gamble Oak, three kinds of Juniper, Aspen & Fir at 7,000 clear cool feet. 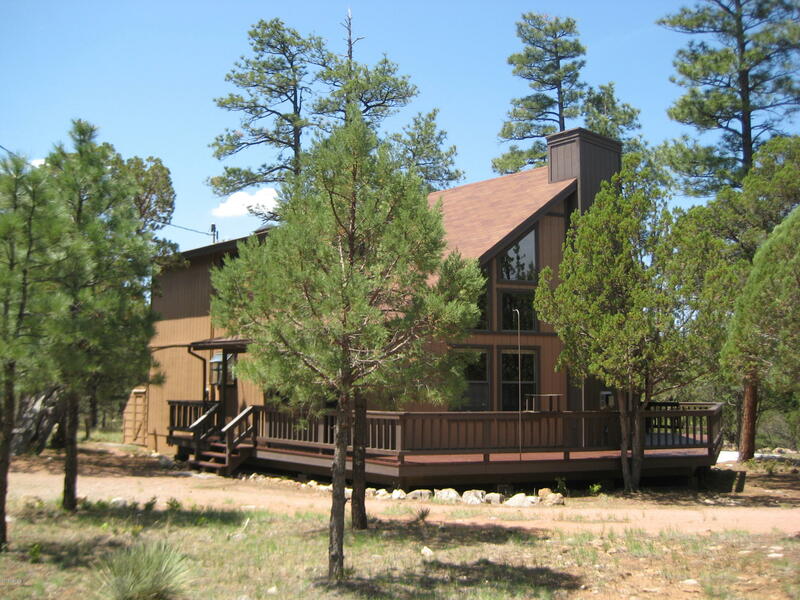 It is surrounded on all four sides & located in the heart of the 1,850,000 acre Coconino National Forest. 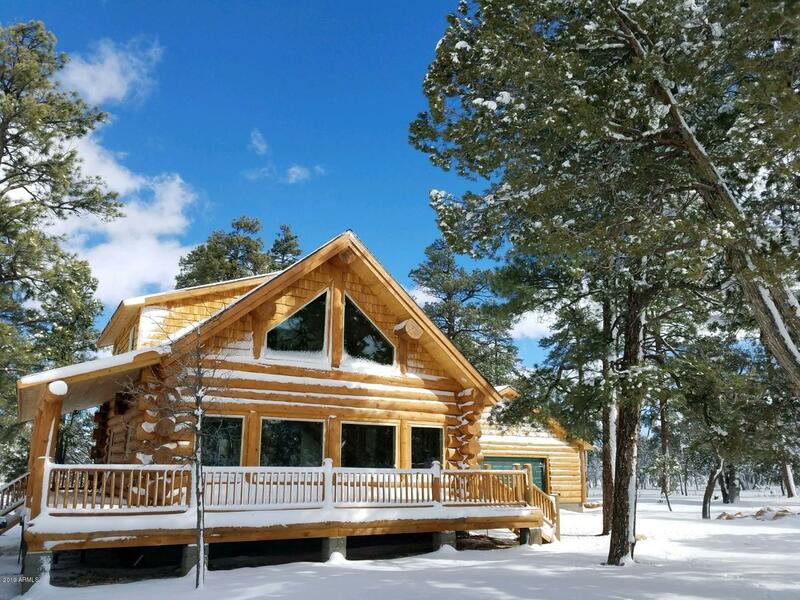 A 1,399 square foot main residence with a 760 square foot garage/workshop & a separate guest bunkhouse provide very comfortable accommodations for friends & family. Ownership includes Little Springs i"
"MOTIVATED SELLER!! This home has it all featuring Blue Spruce ( including ceilings) Scandinavian cut logs with an average log size of 22'' to 36''. Upstairs you will find the master bedroom suite with a sitting room and your very own walk out balcony. Granite counter-tops through out including the bathrooms will assure you the owner did not spare any expense on this home. From the epoxy garage floors and breezeway floors you will enter through the elevated hallway into the living room where yo"
"THIS RARE BEAUTY SITS ON ALMOST 2 ACRES AND BORDERS THE GREEN BELT WHICH IS ONLY FOR HIKING AND HORSE BACK RIDING. MAIN FLOOR ENTRY IS LEVEL WITH THE DRIVEWAY BUT WALK TO THE BACK OF THE HOME AND YOU ARE SITTING HIGH IN THE TREES WITH WONDERFUL VIEWS. OPEN FLOOR PLAN PERFECT FOR SOCIALIZING WITH GUEST. MASTER SUITE ON SECOND FLOOR FOR PRIVACY FROM OTHERS IN THE HOUSE. THE MASTER BATH HAS LARGE SHOWER, LOTS OF STORAGE, DOUBLE SINKS WITH SPACIOUS COUNTER TOP, LARGE WALK IN CLOSET YOU HAVE HIS AND "
"BEAUTIFULLY APPOINTED HOME. CUSTOM MADE KITCHEN CABINETS ARE KNOTTY ALDER. LARGE KITCHEN ISLAND WITH SEATING, GRANITE COUNTER TOPS. VERY OPEN SPLIT FLOOR PLAN. MASTER SUITE, SPACIOUS BATH ROOM WITH WALK IN CLOSEST. 2 BEDROOM AND FULL BATH ON THE OTHER SIDE. AREA IN THE HALLWAY WITH UPPER AND LOWER CABINETS. PLUS A BONUS ROOM CAN BE A POTENTIAL BEDROOM, DEN OR OFFICE. ROOM LAUNDRY ROOM WITH CABINETS. GAS FORCED AIR HEAT AND SKYLIGHTS. BEDROOM FLOOR ARE CARPETED, KITCHEN, GREAT ROOM AND FOYER HAVE"
"BEAUTIFUL WELL BUILT HOME, TRUE PRIDE OF OWNERSHIP. THE HOME IS 2240 SQ.FT. LOCATED ON 1+ ACRE LOT ON A QUIET STREET. 2 BEDROOM PLUS LARGE SLEEPING LOFT AND 2 BATH WITH OPEN FLOOR PLAN. NEW SOLID PINE FLOORING IN KITCHEN, DINING AND HALLWAY. NEW HIGH QUALITY CARPET IN ALL OTHER AREAS OF THE HOME. KITCHEN HAS CUSTOM HICKORY CABINET WITH NEW HARDWARE. NEW LIGHT FIXTURES INSIDE AND OUT. THERMOSTATS INSTALLED IN BASEMENT AND MAIN FLOOR SETS A CONSTANT TEMP YEAR ROUND. WALKOUT BASEMENT IS A BONUS. LI"
"CHALET IN THE FOREST. 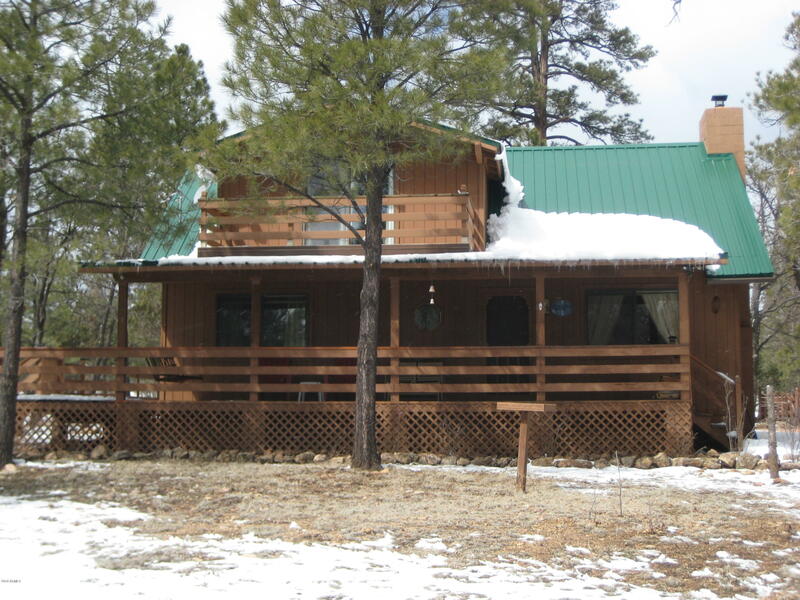 PROPERTY HAS SEVERAL MATURE PONDEROSA PINE TREES AND OAKS. THIS HOME IS 2 BEDROOMS ON THE FIRST FLOOR AND A LARGE LOFT FOR OFFICE, DEN OR EXTRA SLEEPING SPACE. GREAT ROOM HAS CATHEDRAL CEILINGS, BEAUTIFUL STONE FIREPLACE WITH T&G ACCENTED UP TO THE CEILING. EXPOSED BEAMS ADD TO THE HOME. MASTER SUITE WITH PRIVATE COVERED DECK AND FULL BATHROOM. GUEST BEDROOM AND BATH ON THE OTHER SIDE FOR EVERY ONES PRIVACY. COVERED AND OPEN REAR DECK. PROPERTY HAS BEEN VERY WELL MAINTAINED"
"Very quiet street. Totally fenced with top rail, no climb horse fencing. Huge covered deck upstairs & down. Totally furnished, pool table included. Pellet stove, Electric baseboard, And Central propane heat. Refrigeration. Lots of Mature Pine, Oak and Juniper trees. Horses allowed, Large Corral. $200 total yearly water cost. Lots of RV parking. Approx 7,000 ft elevation, escape hot Arizona summers. NO H.O.A." 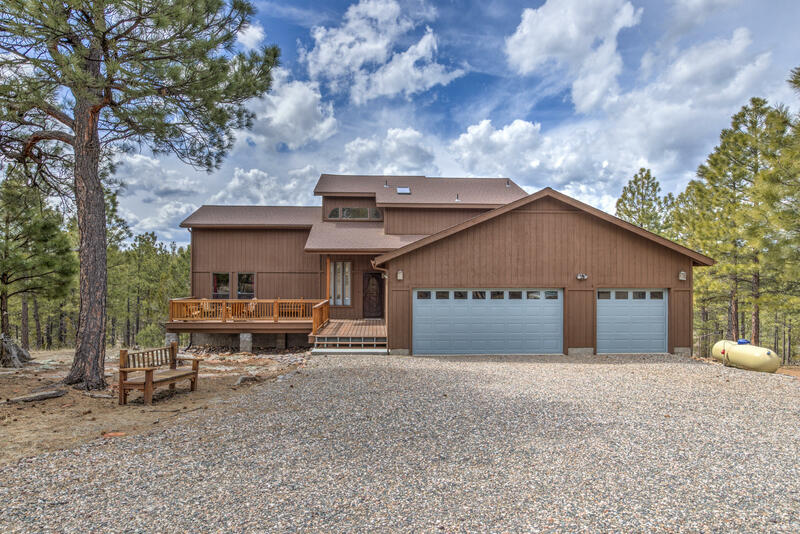 "CHALET STYLE HOME ON A QUIET CU-DE-SAC IN PRISTINE STARLIGHT PINES. COME AND RELAX AND ENJOY THE 4 SEASONS. 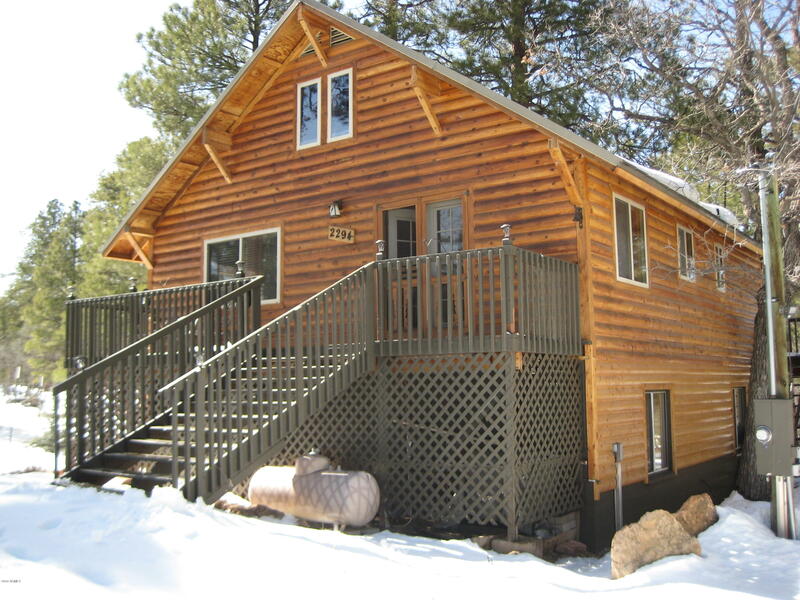 THIS PROPERTY HAS ALL THE AMENITIES WITH A CABIN FEEL. T&G PINE CATHEDRAL CEILING AND PROW FRONT WALL OF WINDOWS. GAS FIREPLACE SURROUNDED BY FLOOR TO CEILING STONE. MASTER SUITE ON FIRST FLOOR HAS OUT DOOR ACCESS, BATHROOM WITH CLOSET, PRIVATE TOILET, SEPARATE SPACIOUS TILE SHOWER AND JACUZZI TUB. UPSTAIRS CAN ALSO BE A SECOND MASTER SUITE WITH ROOM LOFT AREA, CLOSETS AND FULL BATHROOM AN"
"THIS CHARMING WOODY COTTAGE CABIN IS THAT GREAT GET OUT OF THE HEAT GET-AWAY. 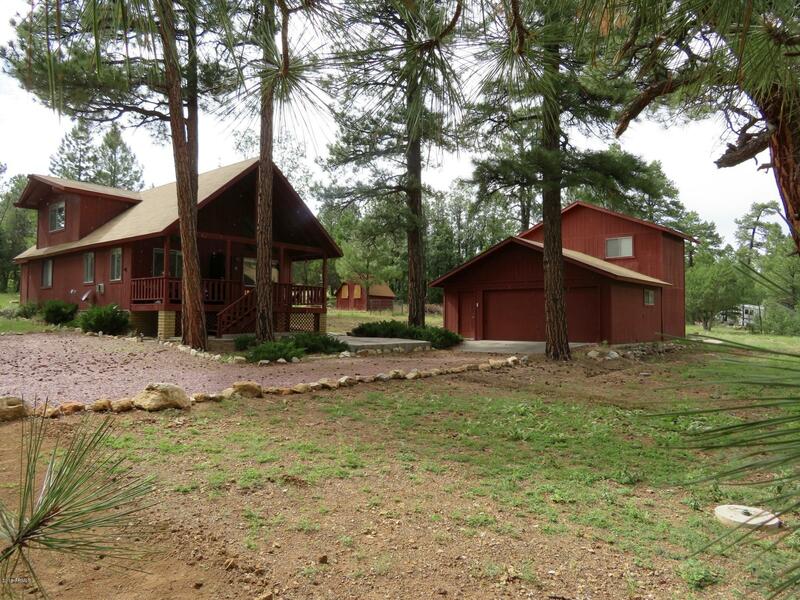 2 BEDROOMS, 2 BATHROOMS, OPEN FLOOR PLAN ON 1.25 ACRES. 1450 SQ.FT. 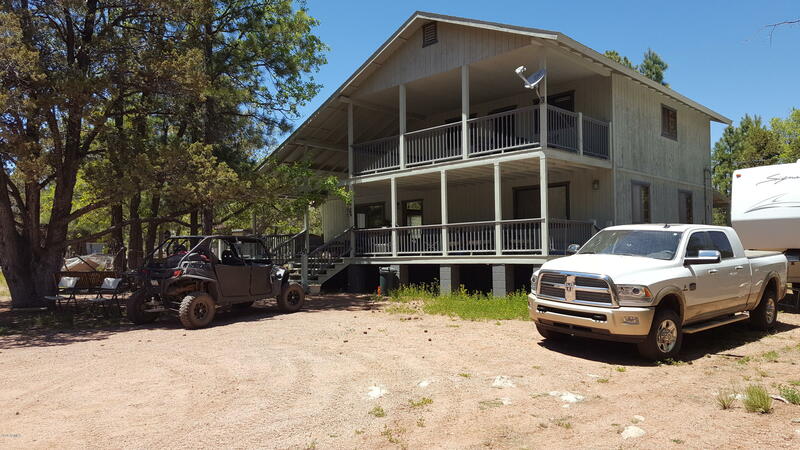 THIS HOME INCLUDES FRONT AND REAR COVERED DECKS CONNECT BY A LARGE OPEN SIDE DECK, METAL ROOF, T&G PINE INTERIOR WALLS AND CEILING PLUS A HUGE 20X32X12 2 CAR GARAGE. THE HEATING SYSTEM WILL WARM THOSE COOL WINTER NIGHTS WITH BOTH GAS AND ELECTRIC HEAT PLUS WOOD BURNING FIREPLACE. INSIDE LAUNDRY AREA OFF THE KITCHEN. PLENTY OF STORAGE. LARGE SLEEPING LO"
"Escape the valley heat to the cool crisp weather, bright blue skies & all the clean air on the Mogollon rim. 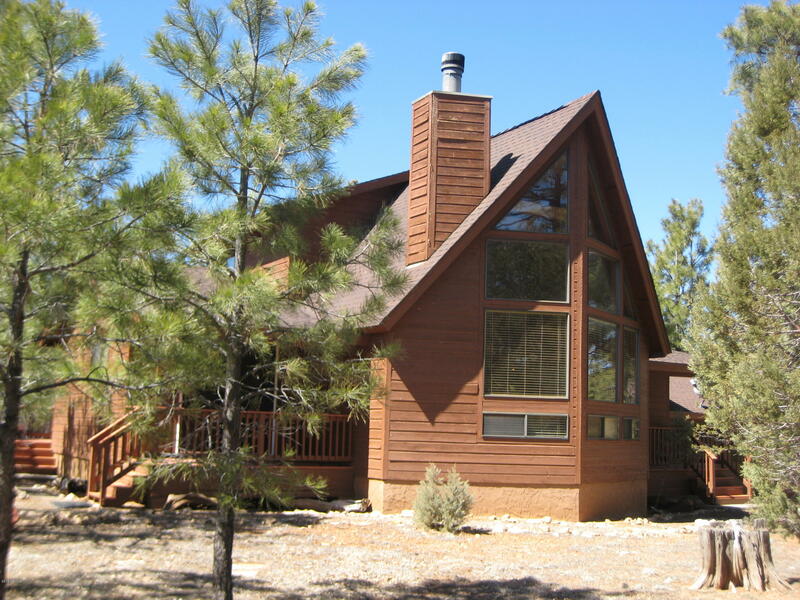 Happy Jack is centrally located between Flagstaff, Payson, Pine, Strawberry & Winslow. With so many off road trails for adventures or hunting. Enjoy the abundant lakes by boating, fishing or kayaking. 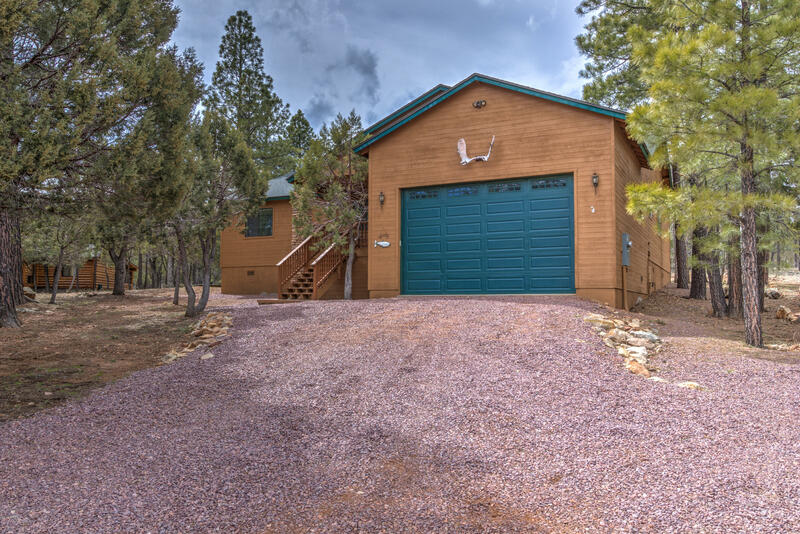 This Chalet Style home features 2 bedrooms, 2 baths & sits on a premium 1.11 Acre corner lot with tall pine trees that backs up to greenbelt for walking and horseback riding. Detached garage"